If you don’t know, that’s completely OK! 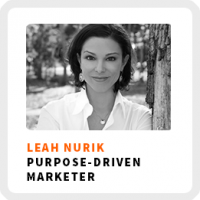 Leah Nurik is going to give you permission to define the purpose of your work and what makes you happy in your work. And your happiness is not just influenced by what you are working on, but also by how you get to work. Leah is the CEO of Gabriel Marketing. It’s a strategic marketing and integrated communications firm focus on high-growth tech companies that want to change the world. She says she loves working with fringe lunatics. How Leah learned how to take risks on someone else’s dime while working at Motorola. How she evolved her business from freelancing into an agency. She describes her own unique mix of ingredients that make her happy in her work. Core work activities + habits: 1) Spreadsheet analysis to keep an eye on the financials. 2) First-calls to introduce the agency to potential clients. 3) Looking at 85-90% of the content that the agency produces. Ideal work environment: Around 9:00pm, after the kids are asleep and in silence. 90-day goal: Close a couple new clients before the end of the year and achieve their margin goal. 1) It takes time. Starting out, there isn’t a roadmap to dictate what clients you’ll work well with and which ones you won’t. 2) Take every client early on. Look at what works and what doesn’t, embrace the bumps in the road, and use the experience to build a profile of who you’d most like to work with. 3) Stay flexible. Just because you have an idea of who you do or don’t want to work with doesn’t mean you can’t change it as you go and it can actually limit your opportunities.